The past couple of evenings I have had the luxury of spending time in my craft room. What a happy place! Bright colors, lots of supplies, and glitter EVERYWHERE!! 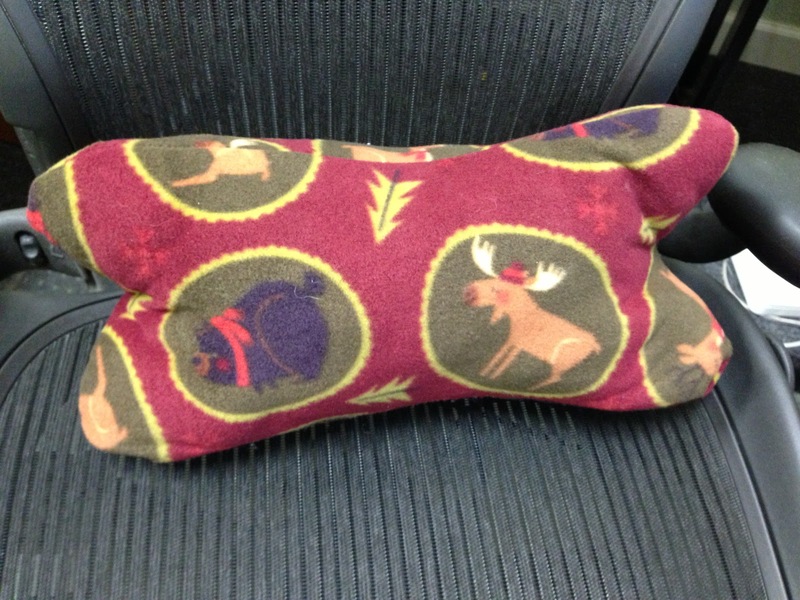 I was at a craft show in Tennessee this past week and wanted to purchase another bone pillow like the one I had purchased for hubby the year before. The lady didn't want to make change for me because it would "take all her $5's"...guess she didn't have any $20's??? Grrrr. Anyhow, her loss. No sale. Well...I've been wanting to get a sewing machine. I have an embroidery machine, but it's a pain in the a** (PITA) to switch stuff around to go from embroidering to sewing. So I wanted something to just sew! And since my birthday is Saturday, I did what any intelligent wife would do....I bought myself the machine I wanted and told my hubby "Look what you got me for my birthday!!!". Fortunately, he didn't even yell. Just grumbled something about "that's all you're getting then" and went about his business. Tee Hee....I love my present, Scotty! Well, I brought home my Brother, unpacked it and set it up and set about making a pattern for this pillow (which I originally wanted to get for my boss for his "power naps"). First attempt mind you...it turned out soft and cuddly and not too shabby. (Don't laugh too hard!) Now I just have to make a few more for some gifts (and one for me!) and then I will move on to another project. There's always another project. Now, after my stencil class a couple of weeks ago (see previous post), I have been hooked on glitter and stencils and all things twinkly. 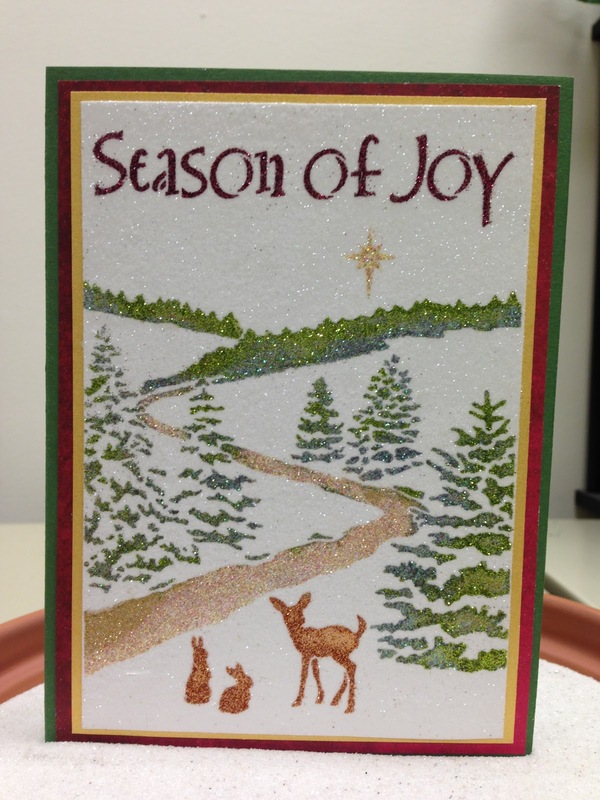 Generally for Christmas I come up with one design and mass produce. 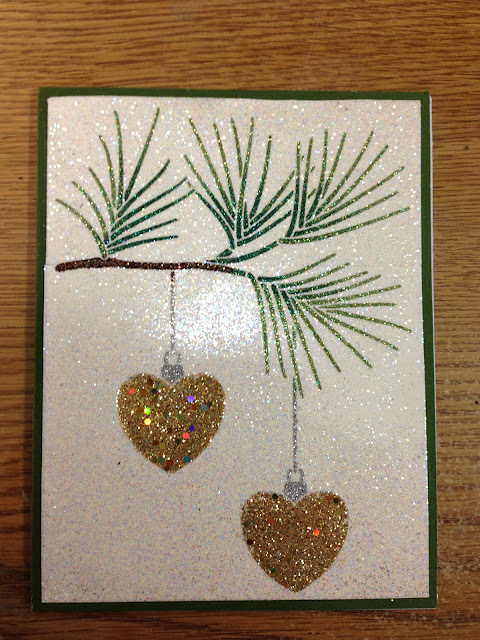 This year, I'm making some very special one-of-a-kind cards for some very special one-of-a-kind people. This is the second card I've done (the first is also in my previous post). 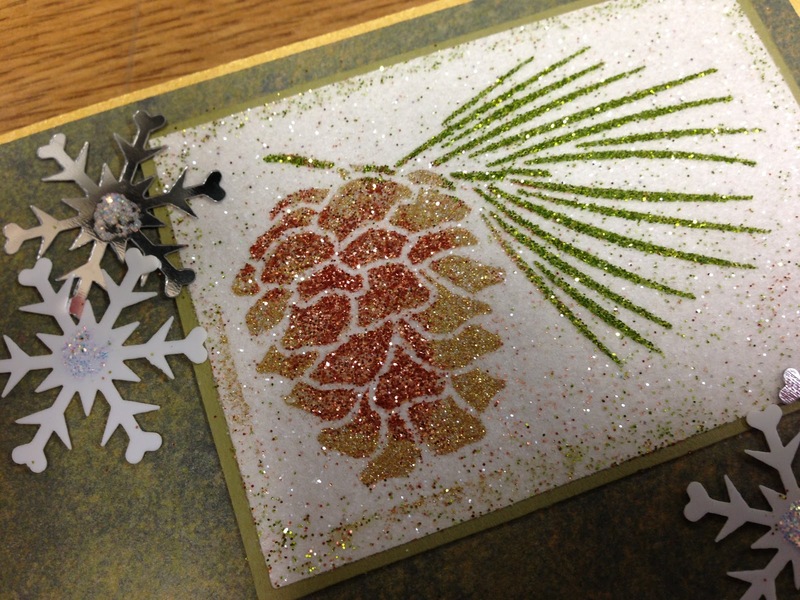 I have had the pinecone stencil for a LOOOOOOOOONG time, but I was never happy with anything I tried with it. Until the wonderful world of glitter, that is. I have to thank (blame) Laura Drahozal from Dreamweaver Stencils and Kathy Mast at Altered Art Addicts for getting me hooked on this...Kathy for having the class and Laura for teaching it. You have created a MONSTER! Anywhoooo, I whipped out all my vats of glitter that I have been hoarding (and some new ones I may have purchased recently...again, the birthday thing) and got to playing. I must say I really like how this card turned out. The "Season's Greetings" stencil is a Dreamweaver one I recently acquired (yesterday :D ) and the snowflakes I've had for eons. Some sort of confetti thing, I think. I have a lot and manage to use a few each year on something. 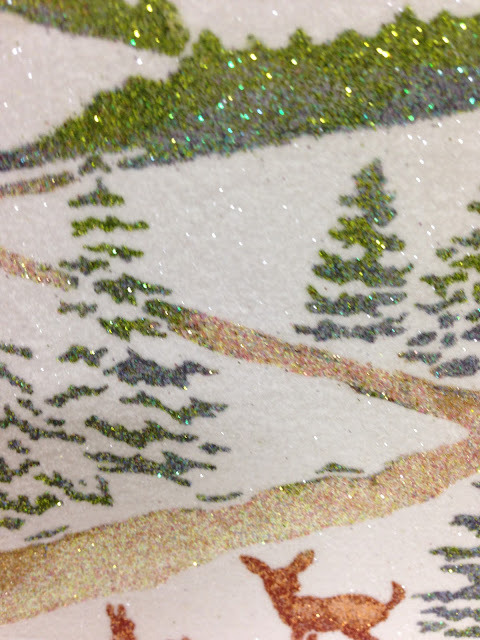 Actually, with the exception of the one stencil and one or two (ok, three) new glitters, everything was from my stash. So I leave you today with the wish for a day full of twinkliness. 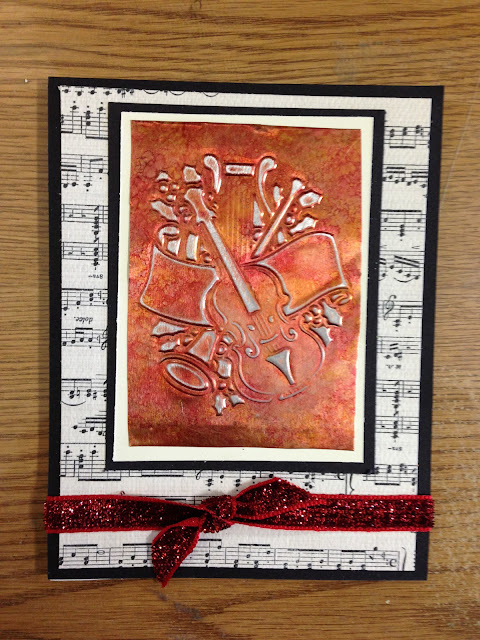 I was fortunate enough to attend a Dreamweaver Stencil class at my LSS, Altered Art Addicts, this weekend. The class was taught by Dreamweaver Stencil's very talented design team member, Laura Drahozal (click here for her wonderful blog). The cards you see above were the results of my interpretations of the techniques taught by Laura. One wonderful class. That's all it took...I was HOOKED! I had purchased stencils before....quite a few actually. But was never really "into" how they were used. That all changed yesterday. I learned several new techniques that have converted me. This first one is done with alcohol inks on thin metal sheets. The stencil is used to emboss the image in a die cut machine (Cuttlebug, Sizzix, and the like) and then you blend alcohol inks onto the metal, sand, and mount. Easy-peasy and what a delicious result! This next card is done by machine embossing the stencil onto multiple colored sheets of the metal, then cutting strips and "reassembling" the design. Then it was sanded, trimmed and mounted. This technique took a little longer but the result was beautiful! 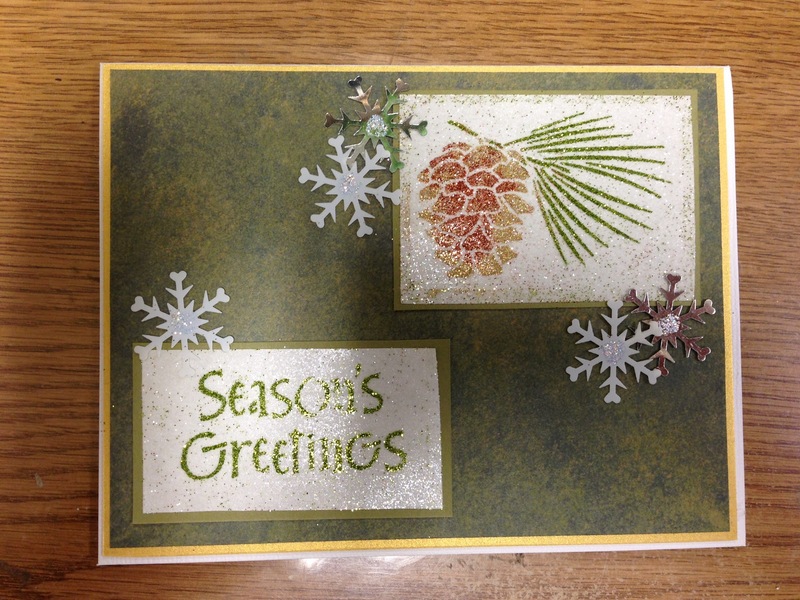 The next one was a very fun technique using the stencil with the Dreamweaver Embossing Paste. The stencil was placed on acetate and the paste applied (reminded me of spackling the walls, lol). It was then glittered with fine glitter. Then the alcohol inks were applied to the reverse side of the acetate. I love how gorgeous this turned out! The marbling of the alcohol inks on the background really stand out and look amazing! But this one, by far, was my favorite!!!! It's like "painting" with glitter! 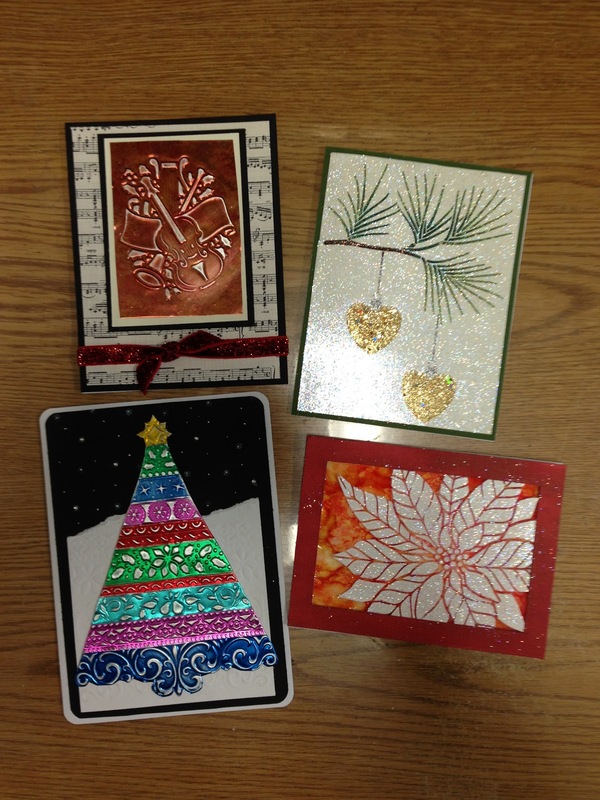 Who doesn't love glitter! It's shiny and twinkly and mystical! 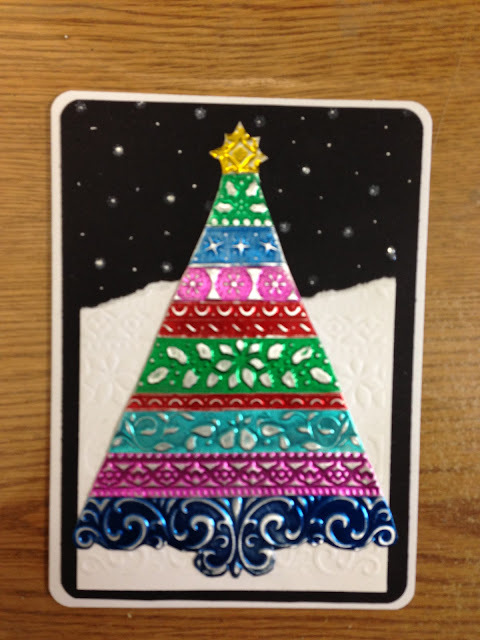 You begin by using two sided sticky paper and placing your stencil on it. Then by using tiny bits of glitter (a little goes a really long way) you sprinkle and blend the different areas with your chosen colors. 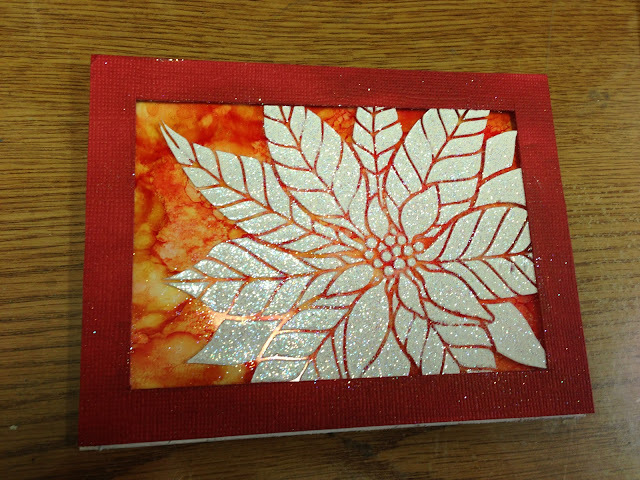 Then you remove the stencil and cover the remainder of the design with the white glitter. The picture doesn't even do it justice. So after the class was finished, naturally I had to add some supplies to my already obnoxious craft collection. Loaded with some metal sheets and two-sided sticky paper, some new colors of glitter, a new stencil, a couple of neat Dreamweaver tools, and a newfound sense of craft divaness (is divaness a word? ), I headed home to my "craproom" as my granddaughter calls it, and spread all my new "stuff" all over so I could play...er, create. A short time later, Voila! I am in LOVE with the results! Granted, I am not doing this card for EVERYONE on my mailing list cuz, well, I just don't have that kind of time available (I have to work for a living...my family likes food and a roof over their head and I like to be able to buy my toys...er, tools...). But there are a few special ones who will receive this labor of love. Just look at this closeup of the finer details..... ooooh....aaaaah. So if you get the notion to check out these amazing stencils, I highly suggest you visit these links: Dreamweaver Stencils and Remembering Life's Moments. You will find lots of inspiration, ideas and instructions. I would love to see what you come up with!